1st & 2nd Master Courses Admission Open A.Y.2017-2018 Apply Now! Check our YouTube channel and Facebook page. Also, here's the Aftermovie of the conference! 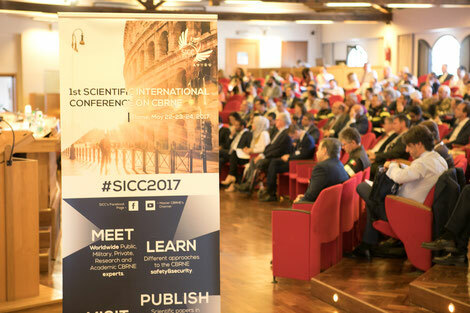 SICC 2017 (Rome, 22-24 May 2017), the first scientific international conference on safety & security issues in the CBRNe field (Chemical, Biological, Radiological, Nuclear and explosive) organized by the International Master Courses in Protection against CBRNe Events of the University of Rome Tor Vergata, and the non-profit association HESAR - Health Safety Environmental Research Association Rome. The SICC 2017 will be held under the auspices of the Italian Ministry of Health. La conferenza SICC è organizzata sotto il patrocinio del Ministero della Salute. Students and Researchers: why should you join SICC 2017 Conference? The SICC 2017 Organizing Committee is pleased to announce the launch of 20years.opcw.org – a website dedicated to the 20th Anniversary of the Organisation for the Prohibition of Chemical Weapons (OPCW). SICC 2017 is included in the List of Confirmed Events. Discover the events and initiatives happening around the world and throughout 2017 to raise awareness of chemical weapons issues, challenges, and the path ahead.